PATRIOTISM guided their hands as much as professional pride. In the summer of 2008, I visited some of the towns of the ‘Golden Ring’, the name given to the tourist route which takes in some of the splendours of Medieval Russia. In Rostov Veliky, craftsmen were carefully restoring frescoes. At best frowned upon during the Soviet era, churches were now benefiting from the riches flowing into the new Russia with rising oil prices. 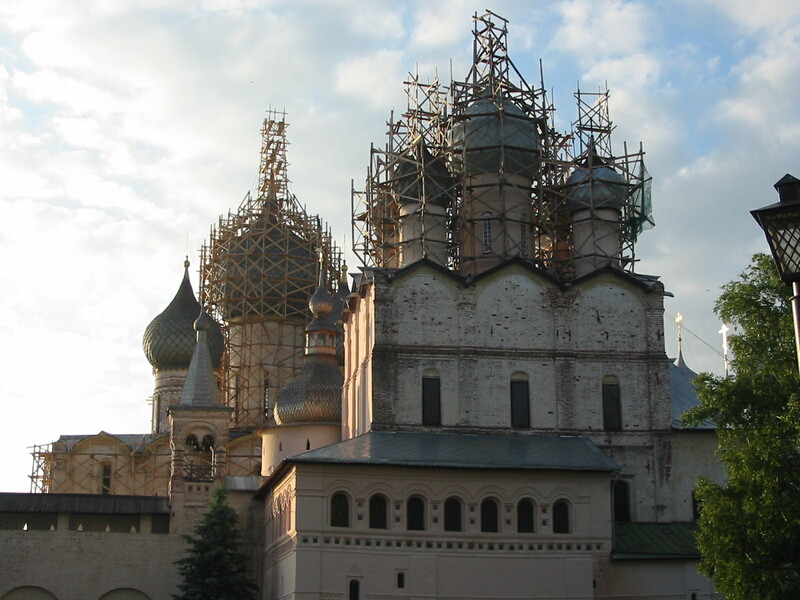 Scaffolding surrounded onion domes finally being fixed up after decades of hard winters. It was not just artists and masons who were making Russia proud that summer, as I noted in a piece for the BBC’s ‘From our own Correspondent’ programme. The nation’s footballers had made greater progress than any Russian team since the collapse of the USSR. They reached the semi-finals of the European Championships. As would happen anywhere in the world, there was a surge of support for the national team. Russia was back. 2008 was a key year for Russia in international football. In addition to the achievements of the team, Moscow successfully hosted the Uefa Champions’ League final. Experiments with visa-free travel for fans, and a charm offensive by the most aggressive police units (I was astonished by the uncharacteristically polite assistance offered by members of one group when I was looking for the media office), were a great success. It seemed then to be part of a Russian bid to host a major tournament. Sure enough, the country was later awarded the 2018 World Cup. 2008 was a big year in Russia’s international relations, too. A few weeks after my trip around the Golden Ring, I was reporting on Russia’s war with Georgia. Sparked by the Georgian government’s deployment of troops to the separatist region of South Ossetia, Russia responded by invading South Ossetia to drive them out. It was a low point in post-Soviet Russia’s relations with the West, where few accepted Moscow’s claim that it had acted to protect civilians in the breakaway Georgian territory. It had also acted to end Georgia’s ambition to join NATO. This it did, at a time when both Georgia and Ukraine were making moves in that direction. Yet the campaign, hailed then in Russia as an example of a once weakened former superpower striking back, also exposed shortcomings in Russia’s combat readiness, and military technology. Acting on lessons learned then, Russia seems to have learned to move much more efficiently against the current Ukrainian government’s desire to move closer to European and Atlantic institutions. That confrontation has damaged still further Russia’s relations with the West. It is in that already tension-filled arena that another diplomatic row is kicking off — one which is football-related. President Putin has already suggested that the U.S.-led investigation into alleged corruption at FIFA may be ‘ part of an attempt to take the 2018 World Cup away from his country’, as the Moscow Times put it last week. At the weekend, a top FIFA official, Domenico Scala, raised the prospect of tournaments being taken away from both Russia and Qatar, ‘should there be evidence’ that they had won the right to host them, ‘only because of bought votes’. So there is a lot to play for. Confrontation over Ukraine, and controversy over Russia’s dim view of gay rights, may have meant that the Sochi Olympics last year did not deliver Moscow the international acclaim it presumably sought when it bid. Football has been an important part of Russia’s drive to regain the status it lost at the end of the last century. Losing the right to host the World Cup will not be seen in Moscow as only a game.